Individuals from Kaleida Health and Eastern Niagara Hospital (ENH) put the finishing touches on Grossi Memorial Park on Saturday June 11. 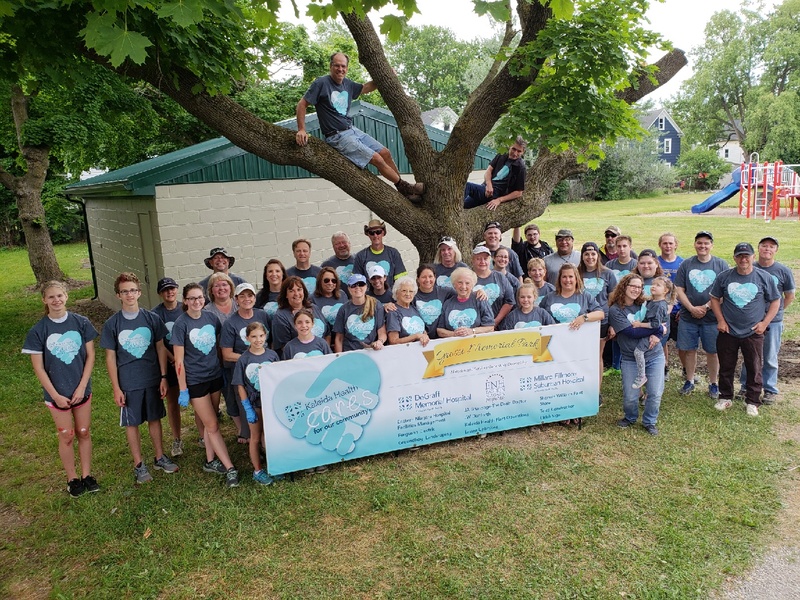 A group of approximately 75 individuals from Kaleida Health’s DeGraff Memorial and Millard Fillmore Suburban along with affiliate Eastern Niagara Hospital joined forces to revitalize Grossi Memorial Park, a hidden treasure in Lockport, this spring. Together the facilities along with local businesses volunteered their time, materials and tools to bring life and a fresh look to the park. The two phase project was an idea brought forward by individuals at the two Kaleida Health facilities to welcome Eastern Niagara and the Lockport community to the Kaleida Health family. The initial work was done in time for the Marine Corp Memorial Day service held at the park on May 21. Additional clean up, landscaping and painting to the basketball court, restrooms, bike racks, playground and picnic pavilion were completed this weekend. The park’s entrance sign will also be re-done this month. Betty Grossi Junke, a surviving sister of Dominick Grossi, the 1938 Lockport High School graduate and World War II veteran killed in the battle of Iwojima whom the park was established and named after, is a Lockport resident and ENH volunteer with 80,000 hours of service. Junke and her sister Patrina, visit the park often and have personally thanked all the volunteers that helped revive the park. The project wouldn’t have been possible without the generous support from the following vendors and community partners: DeFlippo’s, Ferguson Electric, Groundhog Landscaping, JA Brundage-The Drain Doctor, JW Danforth, Lawns Unlimited, M. Carter Décor, Sherwin-Williams Paint Store, Telco Construction and Ulrich Sign Company, Inc.